I hosted a family BBQ this weekend, as it was a long weekend here in Canada (Victoria Day weekend, also known as May 2-4 weekend). 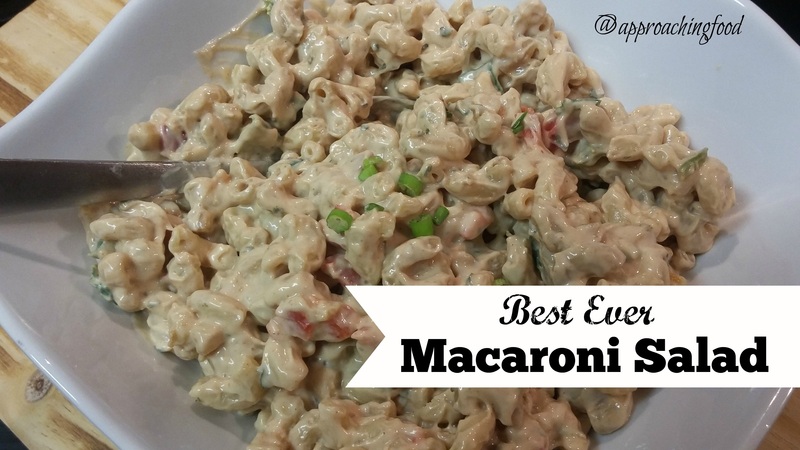 One of my contributions was my Best Ever Macaroni Salad! It was a hit! This macaroni salad isn’t your sad buffet macaroni salad, but is a fresh version with no preservatives but a whole lotta flavour! A variety of spices give it flavour, and the secret ingredient, balsamic vinegar, gives it that umami taste that makes your mouth water in anticipation. This is a very easy macaroni salad to throw together, and it gets better the longer it sits in the fridge. I have used fresh red and green peppers in the salad (for colour and crunch) and other times I’ve used dehydrated red and green peppers. The seasonings can of course be adjusted to your own taste. Make it your own! Want to make some? Let’s get started! This easy pasta salad is great to bring to BBQs or family dinners. Easily thrown together from mostly pantry ingredients, you'll knock of everyone's socks with the great taste of this salad! Mix all ingredients together, and let sit in fridge for at least two hours. Serve chilled! Oh, and guess what? The title to this post referenced it, but…I’m pregnant! Did you figure it out from my gender reveal cake post a few weeks ago? I wasn’t announcing it then, so I tried to imply that it was for someone else, but it was really about ma bebe. Because I’m having a little girl! Am so excited. My husband and I call bebe-to-be by a nickname, Baby Pina (baby pineapple), so I think that shall be her blog name. Baby Pina is expected in about 5 months, and let me tell you, I can really notice an increase in appetite (at least now that the all-day and all-night morning sickness has eased off a bit). I need to eat every few hours or else I get all vomity. Fun times. So, lots of protein-rich food it is! I made Easy Enchiladas yesterday, but used a heavy hand with the beans to up the protein, and plan to make yoghurt tomorrow to add into my favourite smoothies during the week. In other words, lots of healthy food! Next Post: Something healthy but delicious, I think! Heavy on the delicious. I haven’t decided what to make yet, but am craving something creamy. And sweet. Maybe a custard cream cake? Not so healthy, but oh so delicious! Linking Up at Meal Plan Monday, Clever Chicks Blog Hop, and at Happiness is Homemade! This entry was posted in Salads I Have Known and Loved, Vegetarian Side Dishes on May 21, 2018 by Margaret. OMG congrats! That is SO exciting! I’m not familiar with nutritional yeast. Is it necessary or can i omit this?? Great question, Margaret! You totally can omit it. I use it sometimes to add a slightly cheesy flavour to dishes, and it’s also high in b12. I buy it from my local bulk store, but a health store should carry it as well. But again, in this dish, you can omit it. Completely up to you! Thanks so much, Becky! You’re so sweet! And you’re totally right, I’m already planning baby food recipes! And lactation cookies, and…you get the idea! Congratulations. Little girls are amazing. Thanks, Marybeth! I am indeed looking forward to her! Congratulations! Have to admit – I did wonder when you said you were ill and couldn’t go with the family last month. 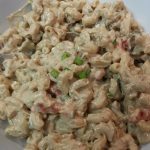 I didn’t think they’d leave you on your own unless…..
PS – I love pasta salad but hate elbow macaroni – I think I’ve had one too many “slimy” versions from my sister. Have you tried this recipe with other sorts of pasts? Thanks, Margie! I was disappointed to miss the family vacation, but my sister stayed with me to take care of me, which I appreciated. In terms of the pasta salad, I don’t see why other kinds of pasta wouldn’t work just as well, such as those little bowties, or rotini. If you try it with other pastas, let me know what you think! Congratulations! Exciting times ahead, enjoy all you can. Thanks, Mary! I am indeed excited! A BABY GIRL!!!! See what you miss when you get behind on reading your blogs because of long work hours! I am so glad and relieved. I agree with Margie from Toronto and was worried when you did not go with your family on vacation. Negative, depressing me was afraid you had a bad illness. I always see the glass half empty. But a BABY GIRL!!!!! CONGRATULATIONS!!! !